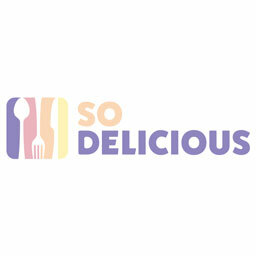 Enter your email address below to get Food News delivered straight to your inbox. Mardi Gras is coming up quick, guys. Regardless of whether or not you'll be in NOLA for the celebrations, you're probably thinking about bringing a King Cake to the table on March 5. FYI, King Cakes are actual cakes that've been used to celebrate the Carnival season in New Orleans for decades — but that doesn't mean you can't order one and devour it in your hometown. 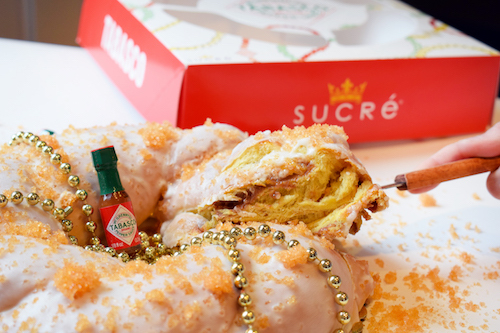 Instead of opting for the OG cinnamon roll-style cake, though, you might want to check out Sucré's Tabasco Sauce-infused King Cake. The Sucré Sugar + Spice King Cake, which is currently being sold at Sucré, a Louisiana-based sweet shop, puts a hot spin on New Orleans' sweet Mardi Gras tradition. How is that, you ask? Well, Tabasco Habanero Sauce is literally used to accent the cake's filling, effectively spicing up the dessert. (As someone who pours hot sauce on everything that I consume, I'm basically ecstatic.) Tabasco Habanero Sauce isn't the only key ingredient that makes the cake so compelling, though. In fact, the cake is full of savory flavors that'll leave your tongue buzzing during Carnival. According to McIlhenny Company (the makers of Tabasco Sauce), the The Sucré Sugar + Spice King Cake starts off like a typical King Cake: with "braided, buttery dough" that's cooked and sweetened with sugar and cinnamon. What makes the Tabasco x Sucré cake unique is that it's filled with "single-bean Swiss chocolate whipped cream cheese filling." However, that filling is essentially spiked (or, as the company says, "accented") with Tabasco Habanero Sauce. I'm drooling. I know, I know, some of you are probably scratching your heads and wondering how a cake infused with Tabasco Sauce would taste. According to the company's press release, the Habanero Sauce adds flavors of "mango, papaya, and banana" to the amped-up dessert. Between those flavors and the sugary King Cake dough, I can imagine that it'll bring the perfect amount of sweet and heat to your Mardi Gras celebrations. Louisiana Saturday night with our Sugar + Spice King Cake, made with @tabasco habanero sauce ? If you want to try the heated Sucré Sugar + Spice King Cake, you can head to Sucré's website and buy one for $27. Just keep in mind that you'll have to order the cake by Sunday, March 3 at 3 p.m. if you want to have it in time for Carnival festivities. If you're already in NOLA (in which case, I'm jealous), you can stop by one of Sucré's locations and pick one up in person. I don't know about you, but I'm already thinking about pouring extra Tabasco on top of my slice. No shame in my hot sauce game.